Metals play an important role in the development of drugs and medicines for the future, and when we combine particular metals with organic molecules to form a drug it’s known as a metallodrug. Particular metals have extremely important roles in human physiology, so by finding out all we can about the different roles they play, we can use this knowledge to develop metallodrugs for different diseases. A wide range of inorganic compounds has been recently investigated as medicines or therapies for dealing with different diseases, even killing or inhibiting microbial growth. The use of mercury, silver, gold, copper, cobalt, platinum, palladium, ruthenium, iron, manganese and titanium is well documented and we’ll see each of the metal elements in action as this series progresses. Lots of factors come into play when we look at how metallodrugs offer potential as anti-cancer, anti-bacterial, anti-viral, or even anti-parasitic drug action. To identify a new target site such as a tumour or a protein receptor, the potential drug action will depend on the choice of metal, its bioactive oxidation states, the different types and numbers of organic molecules attached to the metal (known as ligands) and how those ligands are attached (the coordination geometry). We’ve all seen bottles of zinc sold in pharmacies to take as a daily supplement. Zinc is an essential element and we need it to stay healthy. It’s also a metal capable of interacting chemically and biologically with different organic molecules resulting in unique drug molecules with high bioactive properties. These properties can be tailored to suit the target site and designed to interact in a specific manner. Let’s take a look at the recent history of anti-viral drug development against AIDS (Acquired Immunodeficiency Syndrome) as an example. To design a drug you first need to understand how the virus causes the disease. HIV (Human Immunodeficiency Virus) enters the cell through a protein receptor called CD4 found on the surface of white blood cells. 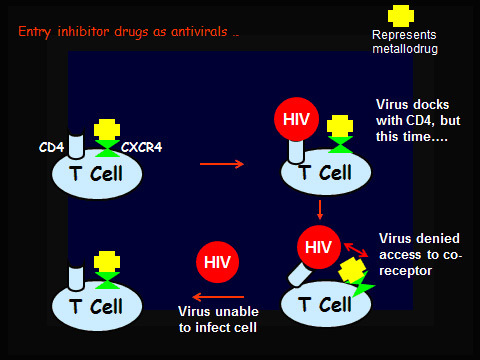 After docking with CD4, the virus uses the co-receptors CCR5 or CXCR4 to get inside the cell. Once inside, the virus can hijack the cell’s DNA effectively turning the cell into an HIV factory, replicating many times to produce new copies of the virus. First-generation drugs targeted different parts of the cell’s DNA in an attempt to halt this copying mechanism at different points in the replication process. Many succeeded quite effectively, but it’s a bit like closing the stable door after the horse has bolted. A different approach was needed. If you can prevent the virus from actually entering the cell in the first place, then it cannot replicate itself and the cell’s DNA remains intact. 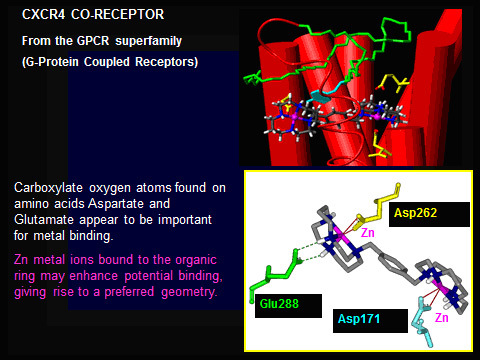 So how do you stop it from using the co-receptor? Enter the next generation Entry Inhibitor drugs. No entry – no replication! In recent years, researchers have developed zinc metallodrugs designed to do just that. 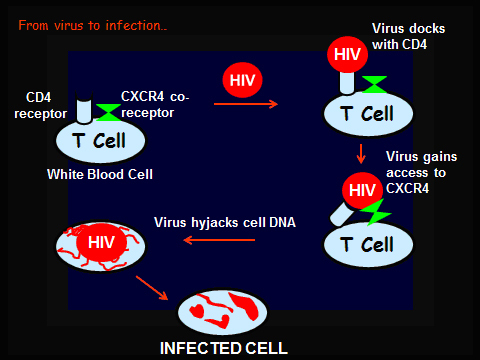 The virus is blocked from entering the cell, so if it can’t access the cell, it can’t replicate. The schematic below shows pictorially how this might happen. This blocking action appears to be due to the unique geometry that these drugs are able to adopt in situ. An example of one of these inorganic complexes is “dizinc xylylbicyclam tetraacetate” – two zinc centres bonded to cyclic polyamine rings form an unusual shape known as a folded cis-V configuration. On one side of the ring the zinc binds with oxygen atoms from a close-by amino acid, and with nitrogen atoms through NH groups from a different amino acid on the other side of the ring. This can be shown using a model to look at how such molecules might be interacting with bioactive groups in the vicinity of the drug. Many variations of this drug have been developed, looking at different ways of producing flexible ligands that interact with the surroundings, and constrained complexes that are more rigid in their positioning. Each has met with varying degrees of success and two of the most successful are marketed commercially at the moment. Organic drugs are often deliberately designed to contain hydrogen bond (H-bond) acceptors (electron lone pair donors). Something that’s perhaps not always recognised is that these acceptor atoms are also potential metal binding sites. It will be very interesting indeed to see what the future holds for metallodrugs and modern drug design. Dr Allison Kirsop is currently Editorial Manager for the journal Neuroendocrinology. She specialises in bioinorganic chemistry, in particular, the role of vanadium and zinc in medicine. She is currently working with her husband in developing a website for the University of Edinburgh School of Chemistry as a teaching aid for undergraduates. She also works as a freelance copy-editor for the Royal Society of Chemistry.